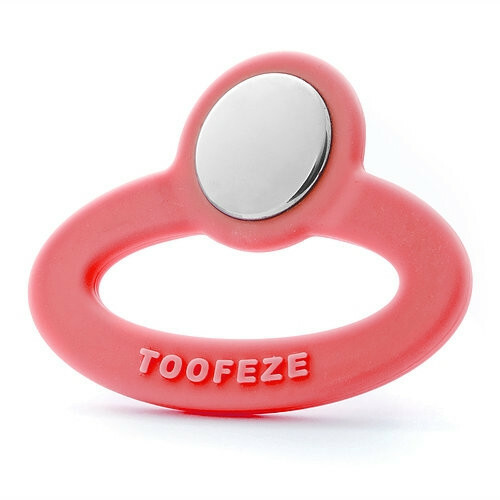 Toofeze is hands-down the most effective teething tool on the market today! 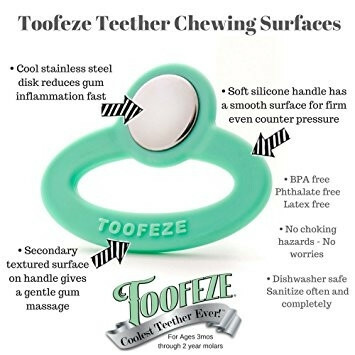 Toofeze is functional, convenient, and allows the baby to easily manage their pain independently, giving parents the relief they need too! Three distinct chewing surfaces made of food-grade ingredients. All-natural & Pediatrician recommended. Cleanse thouroughly before first use. Product may be boiled to sanitize completely. DISHWASHER SAFE. A quick rub with a baby wipe to clean on-the-go. For most effective results - Chill in cold water, refrigerator, or even in front of the air conditioning vent. Anywhere that gets cold - Just do NOT freeze Toofeze.